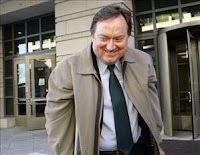 I was saddened to hear, on the Feast of St. Anthony of Padua, of the sudden death today of Tim Russert. The noble host of NBC's "Meet the Press" as well as devout Catholic, Russert died of a heart attack at the still young age of 58. Like Anthony, he died too soon, both apparent victims of their passions, the Franciscan saint of long days of preaching and healing, Russert of endless election year coverage of candidates and politics. I will never forget his lively jousts with his good friend Mike Huckabee, or how he took off his coat to reveal his "Totus Tuus" t-shirt to try to secure an interview with John Paul II. I pray not only for Tim's soul and surviving family, but that the Lord find a like-minded Catholic to take his place on "Meet the Press."